Day two of the Move Festival and the sun is shining. In your face Glastonbury. Not surprisingly considering the headlining act, goths young and old are scattered around the hollowed grounds of Old Trafford. Attempting to warm up the crowd are opening act The Cranes. Their uninspiring blend of trip hop and rock has very little to recommend. The lead singer looks a bit like PJ Harvey, but sounds more like Bjork. The Cranes are inoffensive, middle of the road and half-hearted. They fail to charm the crowd but do show a spark of promise especially during their grungy moment towards the end of the set. However with a lack of identity and the minimum of stage presence The Cranes initially come and go without anyone really noticing. Longview are supposedly the new darlings of the indie scene. From the start these Mancunian lads are cursed with technical hitches with the overall sound coming from the mixing desk poor with the vocals being drowned out by the rest of the band. Musically Longview remind me a lot of Strangelove (remember them?) with just a hint of Dinosaur Junior. They take themselves incredibly seriously, but on new song "Coming Down" they begin to live up to the hype. "Can't Explain" and "When You Sleep" aren't bad attempts and there are lots of fans lapping it up, but I fond them underwhelming and the general feeling was of unexpected disappointment. Posh ex-public schoolboys Keane fresh from their Glastonbury triumph are clearly pleased as punch to be here today. Their enthusiasm is infectious. The keyboard player is like a springed coil, rocking out and having a ball. 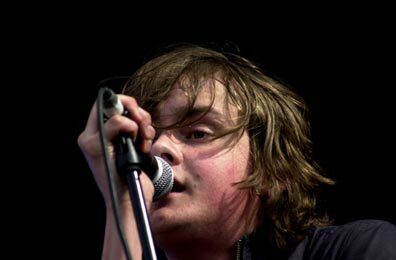 Young singer Tom can belt out the ballads like a seasoned professional patrolling the stage effortlessly. Their number one album "Hopes And Fears" is much more immediate live with the emphasis on energetic delivery. "Everybody's Changing" has the crowd on a crest of a musical wave whilst the ballad "We Might As Well Be Strangers" is reminiscent of Geneva. A couple are B-sides are also performed (one with just the singer and keyboard player). Keane won over the crowd by playing an impassioned, vibrant set full of emotion, soul and vitality. 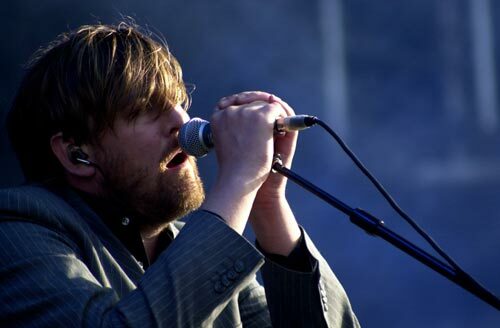 I wouldn't exactly call Elbow a typical festival band but here they are. In the right venue Elbow can do wonders, but the subtlety of their fragile songs can be lost in such expansive surroundings. With two albums to their name Elbow have a strong following and tonight they're on home turf. For such a grand occasion the band have assembled quite a number of extra musicians. "Fallen Angel" is a sensitive lullaby sung wonderfully by Guy Garvie. With the addition of string and brass Elbow's music is elevated to a higher level with just the right amount of pathos. There are rockier moments too, more than their mellow recorded material would suggest. On "Fugitive Motel" and Newborn" these unusual haunting songs have real depth and Elbow are unique in this respect. Badly applied lipstick, a panda eye shadow so severe that Kat Slater would frown in disapproval, an unruly spiky head of hair and a podgy yet comforting frame of awkwardness with an air of disenchantment can only mean one thing - Robert Smith has arrived and he is basically The Cure. 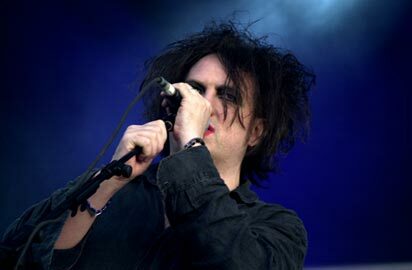 Like Mark E Smith with The Fall, Robert Smith's line-up is an ever changing cast of characters with Simon Gallup being the longest serving member. Smith is such an enigma that the rest of the band serve as glorified session musicians to the star all eyes are fixed upon. 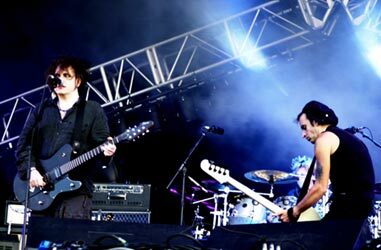 That said in one form or another the Cure have been around for a quarter of a century and have recently been name checked as major influences by Interpol and Hot Hot Heat. The bands new self-titled album was produced by Mr Nu Metal himself Ross Robinson and although slightly rockier than days of yore, its still easily identifiably as the Cure. To see these guys live is a rare treat as they don't seem to tour that much nowadays. All dressed in black The Cure still manage to sound fresh and exciting. Unlike yesterdays headliners Madness who are crowd pleasing nostalgia merchants, you never quite know what's in store. As a band they sound tight, focused and fully in control. "Shake Down Shake" is a track older than many of the teenyboppers but its a timely reminder of early Cure. "Fascination Street" soars with atmospheric delight with an edge of sinister ease. The moshing officially begins during the jolly, catchy "In-between Days" and continues throughout "Just Like Heaven" and "Pictures Of You". Smith doesn't utter a single word because he doesn't need to, that distinctive vocal is more than enough. New single "The End Of The World" is another high point with the guitars loud and heavy. With all this excitement you'd think this couldn't be bettered, but you'd be wrong. With classic cuts "The Forest" and "Boys Don't Cry" finishing their set we go home happy. But if they'd also played "The Lovecats" I would have been floating on a cloud of ecstasy and pleasure.